A throwing stick, also known as a rabbit stick, is a sturdy stick approximately an arm's length long and about wrist thickness in diameter. The throwing stick is used to take down small game such as rabbits or grouse at close range. It can be thrown side arm to maximize the striking area or thrown overhand to get between dense brush and trees. Sticks of the correct size can be used as is, or they can be carved to be more aerodynamic. A fish spear is a long, straight stick that has sharp points and barbs on one end. 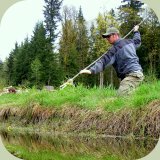 Eight feet is a good spear length to allow you to reach out into a pond or creek. It can be created by smoothing down a branch and carving points and barbs onto one end. A small wedge tied in place with string or plant fiber cordage keeps the points spread apart. The sharp points and barbs can then be fire hardened for increased durability. A quickie bow is a fast-made bow for immediate use in a survival situation. It is carved from a live sapling or branch of a tree. The reason it is called a “quickie” bow is because it is made at the time the wood is harvested, rather than waiting a year for the wood to season. The advantage of this bow is that it is ready to use right away. The disadvantage is that the quickie bow will lose its springiness after a few months of use. 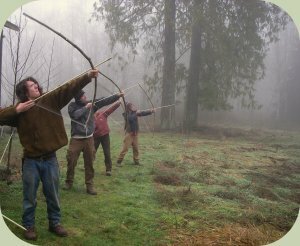 The atlatl is a projectile throwing tool. It is a pre-cursor to the bow and arrow. It consists of two parts – a dart (similar to a small spear) and a cupped or notched launching stick. 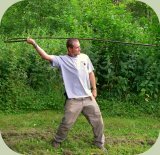 The launching stick allows the thrower to use leverage to hurl the atlatl dart through the air with significant force. Both parts can be carved from wood branches. Hunter-gathers used atlatls to take down many types of animals. 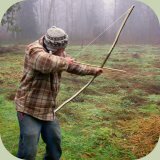 From simple throwing sticks and spears to the more elaborate quickie bow and atlatl, primitive survival tools provide efficient tools for acquiring food sources in the outdoors. When combined with knowledge of traps, snares, game animals, and wild edible plants, there is rarely an occasion when survival food cannot be acquired. Throughout history primitive weapons have enabled humans to thrive in the wilderness. Primitive survival hunting tools are part of the wilderness survival curriculum at the Alderleaf Wilderness Certification Program. About the Author: Jason Knight is the Director at Alderleaf Wilderness College. 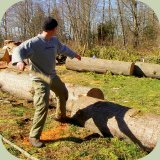 He has been teaching wilderness skills for over twenty years. Learn more about Jason Knight.